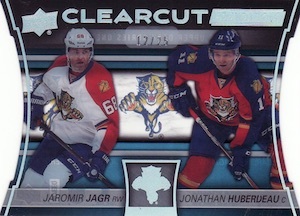 2015-16 Upper Deck Series 1 Hockey has all the hallmarks the flagship release is known for. Young Guns are the big one, but there's the premium but affordable feel that goes with the rest of it. Hobby boxes have six rookie cards, several inserts and the promise of one memorabilia card. Keeping up with recent years, the base set has 200 cards. The Young Guns rookie cards are tacked onto this. 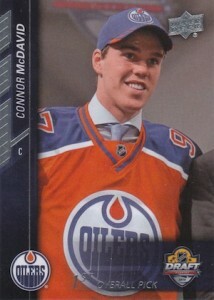 Although 50 is the common size for the rookie subset, the final number won't be known until the season starts and Upper Deck knows how many players are eligible to appear. This includes Connor McDavid, Jack Eichel, Dylan Strome and other 2015 draft picks. 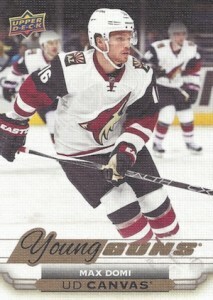 Young Guns fall 1:4 hobby packs or six per box. Both the base cards and rookies have two parallels. Exclusives are numbered to 100 while High Gloss Spectrum have ten copies each. UD Canvas, a parallel-insert hybrid, return. Almost like a separate set within the set, these have a similar but different checklist to the main set. In the past, cards have different images. They get their name from the canvas-like stock they're printed on. UD Canvas cards combine to land 1:6 hobby packs. Canvas Young Guns are 1:48 packs. 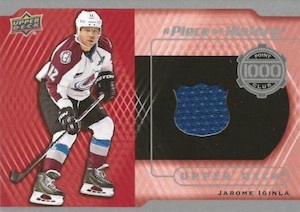 The number of memorabilia cards drop from two down to one per hobby box in 2015-16 Upper Deck Series 1 Hockey. However, they tradeoff is bigger swatches. Most boxes have a UD Game Jerseys card. As with previous years, these have patch versions numbered to 15. The A Piece of History Line continues with more 1,000 Point Club and 300 Wins Club jersey cards. Both are inserted 1:2,400 hobby packs. 300 Win Club Patch cards are numbered to 10. As far as autographs go, they're difficult to pull with Signature Sensations appearing every 288 hobby packs. There are also serial numbered UD Canvas Signatures. Other inserts in 2015-16 Upper Deck Series 1 Hockey should be familiar to those who have collected the brand in recent years. Shining Stars once again have a tiered structure. 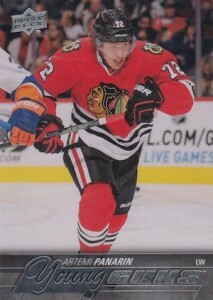 Centers are inserted 1:16 packs while wingers are one per hobby box. Hobby boxes also have Legends, which are every other hobby box. 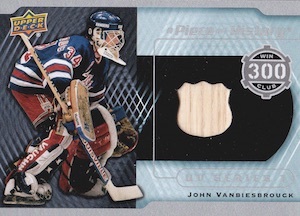 There are also Goalies, but they're found in retail tins. All Shining Stars inserts have Royal Blue parallels. Taking a similar approach with short prints are the Portraits inserts. While there are four per box, some types are easier to find than others. Veterans are 1:7.5 packs. Rookies and Legends are both 1:60 packs. Portraits have Gold (#/25 for veterans and legends, #/99 for rookies) and Blue (#/5 for veterans and legends, #/25 for rookies) parallels. Acetate Clear Cut cards are case hits. They come in the following tiers: Superstars (1:360 hobby packs), Honored Members Update (#/100), Foundations (#/25) and Leaders (#/10). UPDATE: It has been announced that Series 1 will be included in the e-Pack program and is available in that format now. 6 cards. Specific group odds noted below.